5:40-6:00 AM – Personal pick up from your hotel in the center of La Paz to take transportation via a highway to Lake Titicaca. After breakfast, we will board a catamarán cruise to navigate towards the Island of the Sun which is the cradle of the Inkan Imperial Empire. On the legendary island, we will visit the Garden, the Stairs, and the Incan Fountain; afterwards, the itinerary also includes a visit to the Cultural Complex “Inti Wati” – the principal private attraction of Bolivia. 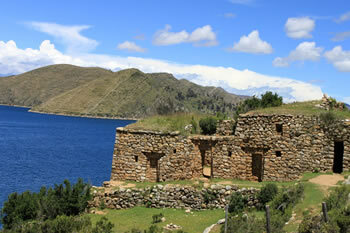 Likewise, we will visit: the Subterranean Museum of the Ekako, the traditional medicine center and the construction center for totora rafts, the Pachamama terraces of Inkan agriculture, an artisan craft center, the Intica refuge, as well as the largest variety of Andean camelids located in the Manco Kapac area. The visit to the Cultural Complex “Inti Wati” also includes the possibility of boating via an immense typical raft made of totora that offers a panoramic view of the Inkan Palace of Pilkokaina. 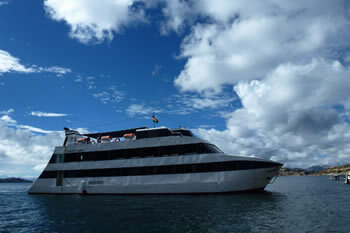 Following this outing, we will then aboard the catamarán again to head to the Chúa/Copacabana port to enjoy a buffet lunch on board; from here, we will take a touristic bus via highway in return to La Paz (arriving at night) or in continuance to Puno, Perú. Included: Touristic Transport from La Paz – Lake Titicaca; Catamarán to the Island of the Sun; Bilingual Tour Guide; Breakfast and Lunch; Paid Entrance + Touristic Bus from the Port (Chúa/Copacabana) to La Paz/Puno. NOTE (1): For those who would like to continue to the city of Puno, you will need to take the Copacabana bus. NOTE (2): In order to provide tour and/or tour package prices, we would appreciate if you would please provide for us the number of people who would be going on the tour. 5:40-6:00 AM – Personal pick up from your hotel in the center of La Paz to take transportation via a highway towards Copacabana. After visiting the Sanctuary of the Virgin of Copacabana, we will board a catamarán cruise to navigate towards the Island of the Sun which is the cradle of the Inkan Imperial Empire; likewise, on board we will have lunch. We will visit the village of Challapampa – a little solitary village at the North of the island where an experimental program of community tourism is offered; those that inhabit the village receive visitors through an innovative program that has been organized by them. A typical house is visited – amongst other specific buildings – like: a school, a chapel, and a little museum that has been implemented by the local people. 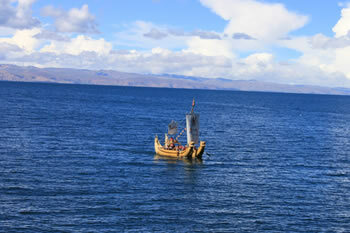 Folkloric demonstrations are given and there is even the possibility of navigating aboard their typical fishing boats. The program includes a walk through Inkan trails visiting the Inkan Temple of the Chinkana. There will be a romantic candle-lit dinner and then an overnight stay in the catamarán’s cabins that provides an exterior view and also private bathrooms. Included: Touristic Transport from La Paz – Lake Titicaca; Catamarán to the Island of the Sun; Bilingual Tour Guide; Breakfast, Lunch, and Dinner; Paid Entrance + Overnight Stay in the Catamarán. AM – After breakfast on board the catamaran, we will continue our navigation, enjoying the wonderful panoramic view of Lake Titicaca, as we head towards the Southern region of the Island of the Sun to visit the Inkan Palace of Pilkokaina; afterwards, the itinerary also includes a visit to the Cultural Complex “Inti Wati” – the principal private attraction of Bolivia. Likewise, around the area, the interesting Subterranean Museum of the Ekako, the traditional medicine center and the construction center for totora rafts, the Pachamama terraces of Inkan agriculture, an artisan craft center, the Intica refuge, as well as the largest variety of Andean camelids located in the Manco Kapac area can be found. We will have a snack in the cultural complex – and, at the end of this part of our trip, we will visit the Garden, the Stairs, and the Incan Fountain. The visit to the Cultural Complex “Inti Wati” also includes the possibility of boating via an immense typical raft made of totora that offers a panoramic view of the Inkan Palace of Pilkokaina. 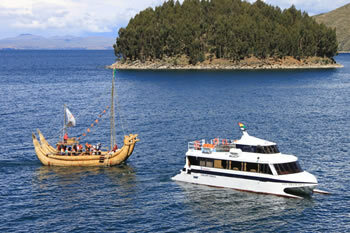 Following this outing, we will then aboard the catamarán again to head to the Chúa/Copacabana port to enjoy a buffet lunch on board as well as a wonderful panoramic view of the lake; from here, we will take a touristic bus via highway in return to La Paz (arriving at night) or in continuance to Puno, Perú.